Alternatives to breakfast norms for people who are hungry and looking to GET FULL in the morning. Are you hungry for breakfast? Will missing a meal cause you to feel deprived or overeat later in the day? If you do not have much of a morning appetite and can eat moderately and happily without breakfast, this post is not for you. There is a popular notion that a “healthy” breakfast should be light and a bit sweet. I blame the food pyramid and 1990s lingering ideals of a low fat diet. Picture cereals with skim milk, lowfat muffins, nonfat sweetened yogurts… However, these refined high carbohydrate options are likely the worst possible choices for the first meal of the day, causing blood sugar levels to quickly rise and fall. Consequences include an unwarranted hunger shortly after eating your office breakfast, which may be accompanied by a crash in energy levels. The following ideas are alternatives to breakfast norms and are for people who are hungry and looking to GET FULL in the morning. 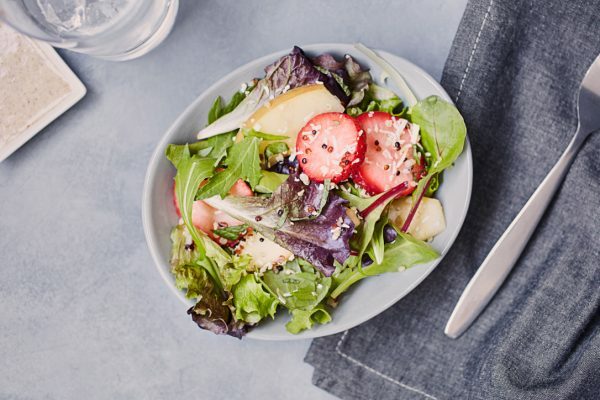 For those who do prefer a slightly sweet breakfast, this dish provides a low-glycemic fruit base with plenty of healthy fats to moderate blood sugar levels. It can be quickly assembled and modified to meet most preferences and dietary restrictions. Top a bowl of berries (strawberries, blueberries, raspberries, etc.) with hemp seeds, unsweetened coconut flakes, crushed almonds, walnuts, or hazelnuts. Sprinkle with a touch of salt, spices (cinnamon, ginger, cardamom), and a bit of citrus zest. 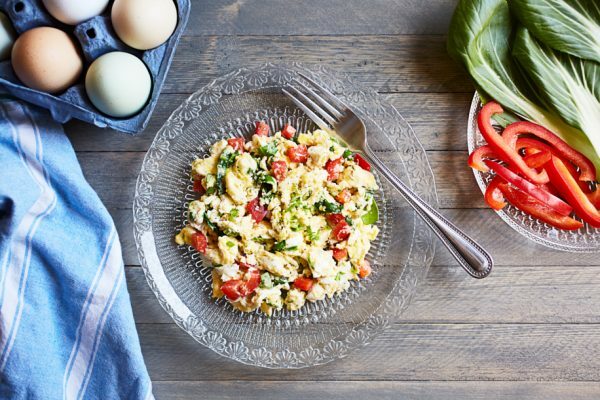 Framble = fried egg scramble – a more delicious, time saving, and dish saving alternative to a traditional omelet or scramble. Frambles combine the best thing about fried eggs (crispy edges) with the best thing about omelets (all the fillings). The idea is to use whatever vegetables you happen to have in the fridge or are the easiest to prepare. Save some leftover veggies from your office lunch! In a skillet, cook leftover or raw vegetables in olive oil. Crack eggs over the vegetables, and season with salt and pepper. Wait until the egg edges are browned and crispy, then quickly scramble them around to complete cooking. This is my signature breakfast, which might be the ultimate comfort or post endurance exercise meal. Oats replete glycogen stores, while eggs and ghee provide nutrients to stabilize blood sugar. For dietary restrictions, gluten-free certified oats or buckwheat groats can be easily substituted, and though I haven’t tried this particular dish with cooked russet or sweet potatoes, I am certain it would be doable and delicious. By stovetop or microwave, cook oats by package instructions. Add a few extra tablespoons of water or bone broth as well as 2-3 raw eggs. Stir to combine, and continue cooking until eggs are done. Top with a tablespoon of ghee and salt to taste. Let’s escape meal conventions and eat what makes us feel satisfied and energized. For the simplest of breakfast salads, top arugula with lemon juice, olive oil, salt, pepper, and poached or fried eggs. Consider that there is absolutely no reason to refrain from dinner leftovers as a morning meal. In fact, I find these often to be the most filling and satisfying of any other breakfast option. Simply open your refrigerator, plate the food, and enjoy it cold or heated. Leftover office lunches or dinners would fit the bill perfectly! We hope this post has given you some morning meal inspiration. Please let us know if you try any of these – we would love to know what you think! What’s your all-time favorite breakfast?